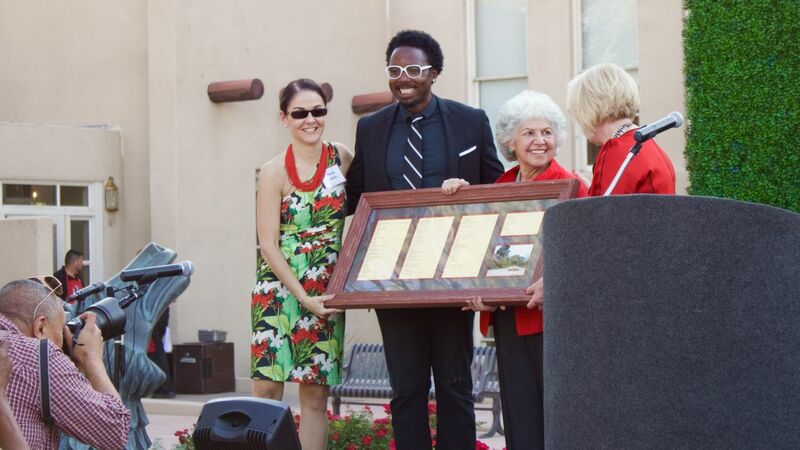 Dana Allen, vice president of Alumni Relations and executive director of the Alumni Association, Poet Laurate Hakim Bellamy, Karen Abraham and Ann Rhodes pose for a photo with the framed poem written by Bellamy to honor Abraham's service to UNM. Alumni Association President James Lewis ceremoniously passed his quite significant presidential gavel. Ann Rhodes accepted it on behalf of incoming president Harold Lavender. 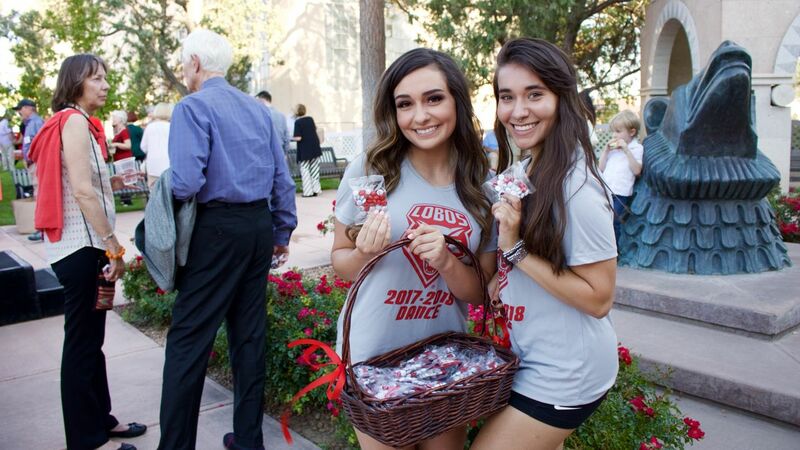 Members of the UNM Dance team helped thank the volunteers who spend their time supporting the Alumni Association and its events. 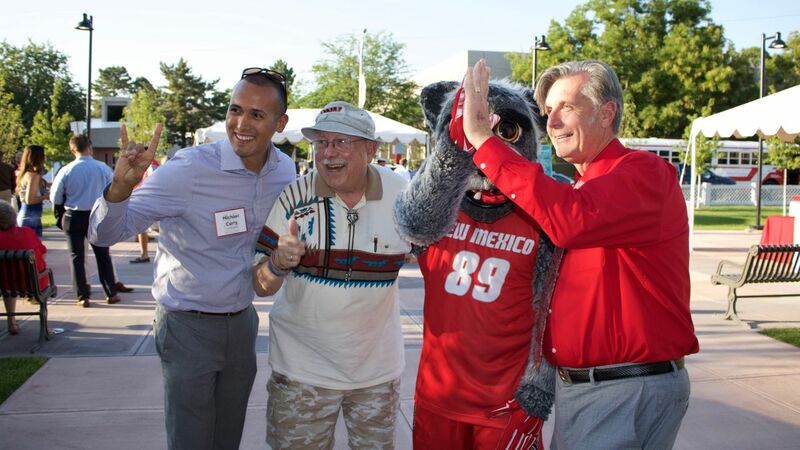 The UNM Alumni Association recently held a Summer Celebration to recognize the work of their volunteers and Lobo supporters. Hundreds gathered outside Hodgin Hall, enjoying live music, food and the opportunity network within the Pack. 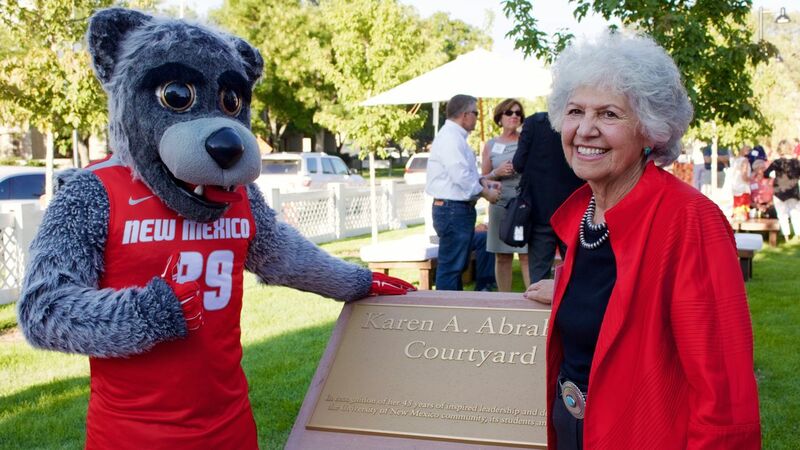 The evening was also made special as the Karen A. Abraham Courtyard was dedicated as a place to honor her legacy and encourage generations of Lobos to leave their own. After more than 50 years of leadership at The University of New Mexico, Abraham retired in December 2015. As a tribute to her steadfast leadership and decades of dedication, the Board of Regents unanimously approved the renaming of Hodgin Hall’s Alumni Center Plaza to the Karen A. Abraham Courtyard in her honor. Ann Rhodes, past-president of the UNM Alumni Association, said it was Abraham’s tireless passion as well as her wit and wisdom, that is a permanent part of this campus. Recently completed, the Courtyard —with sensational box elders, crabapple and emerald sunshine elm trees, benches and a water feature—is now a place that embodies and reflects the history and legacy the Alumni Association hopes inspires future generations of Lobos to achieve. 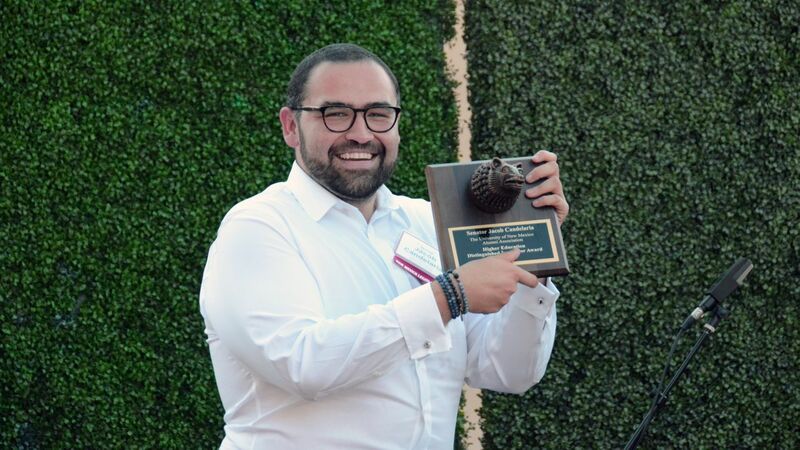 “I will look back fondly at my time here at UNM and I am thankful Lobos have a special place to gather, study and hopefully think about leaving their mark on the University,” said a visibly humbled Abraham. Albuquerque’s first Poet Laurate and UNM alumnus Hakim Bellamy also paid tribute to Abraham with an original poem that celebrated the dedication and commitment that it takes to leave a legacy and what that looks like for the University and the community as it continues to grow and shape the lives of the people who exist within it. During the celebration, the Alumni Association also recognized a legislator who has made a lasting impact on our state, by awarding the Higher Education Distinguished Service Award—an award given to recognize a New Mexico state legislator who has made an extraordinary and exemplary contribution to higher education at The University of New Mexico during the immediate, past legislative session. Lobos for Legislation presented the award for 2017 to Senator Jacob Candelaria. 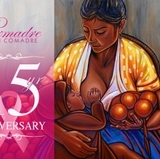 Senator Candelaria was elected to the New Mexico Legislature in 2012, and has quickly risen to hold leadership positions within the Senate. During the 2017 legislative session, the UNM School of Law alumnus sponsored Senate Bill 149, Crime Victim and Witness Confidentiality. This bill provides protection for the identity of victims and witnesses of sexual assault and sexual violence from New Mexico’s Inspection of Public Records Act (IPRA). 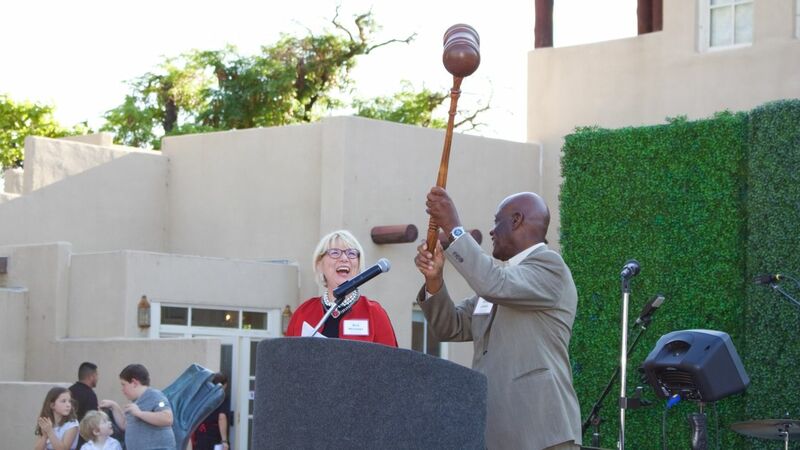 Before the evening festivities ended, Alumni Association President James Lewis passed his quite significant presidential gavel, thanking the Alumni board and UNM community for their support. 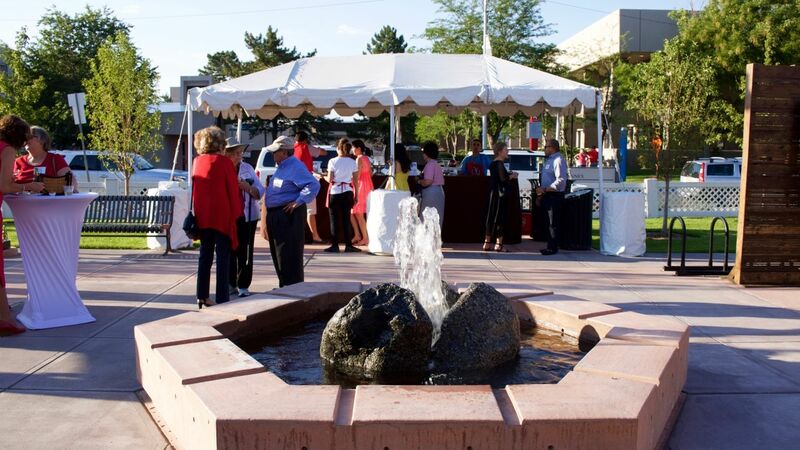 Follow the UNM Alumni Association on Facebook or flicker for event details and photos.